"Sampath Speaking" - the thoughts of an Insurer from Thiruvallikkeni: disobedience of dog saves ~Somnath Bharti gets reprieve ! disobedience of dog saves ~Somnath Bharti gets reprieve ! There is oft repeated phrase ‘It's a dog's life’ – meaning life is hard and unpleasant. There is another phrase associated with dog – ‘dog’s day’…. dog days refers to the sultry days of summer . … .. and would ‘disobedience’ do some good ! : Don – the suspect, facing charges of attack appeared unruffled. Reportedly he was asleep when Police came calling ! His associates told the cops that Don would "raise his voice" if the air conditioner was turned off. The cops left !!!! – baffling ? Labrador Retriever, simply Lab, is one of several kinds of retrievers, athletic, playful, and the most popular breed of dog by registered ownership in many countries. A favourite assistance dog breed in these and other countries, Labradors are frequently trained to aid people who are blind and assist people with autism, act as therapy dogs, and perform screening and detection work for law enforcement and other official agencies. Somnath Bharti, lawyer turned politician representing Aam Aadmi Party (AAP) has been in news. The lawyer was elected as the AAP candidate for the Malviya Nagar constituency in the Delhi state assembly elections, 2013 and was Minister of Law, Tourism, Administrative Reforms, Art & Culture in the Government of Delhi, till Feb 2014, at which time the AAP government resigned. In Sept 2015, Bharti was arrested on a domestic abuse case after his wife alleged he beat her for a prolonged period. A non-bailable warrant was also issued against him by a Delhi High Court and he finally surrendered at the Dwarka Police Station under directions from the Supreme Court. Today he got some reprieve as a court in Delhi gave a clean chit to AAP Somnath Bharti's pet dog 'Don', after a panel found that the dog does not obey any of his master's commands, according to reports. Bharti was asked to call out commands such as "Don come", "Don bark", "Don sit" and "Don bite", among others. The lab dog did not respond to his master's commands, Additional Sessions Judge Anil Kumar said in his judgement. Bharti's wife Lipika Mitra had alleged that Bharti had set the dog on her when she was pregnant. But the court said that her allegations were "unfounded". The court also observed that the recorded conversation regarding the alleged incident and the Labrador's subsequent examination by the vets reflected versions different than Mitra's allegations. It is all about the 12-year-old golden-brown Labrador that ambled around Somnath's office as the politician prepared to present his case at the Dwarka (North) police station. One Press reported that when its reporter called on the politician, Don, weighing around 35kg, slowly approached him and smelt his notebook before settling on its haunches, wheezing. In the FIR registered, Somnath was accused of, among other allegations, trying to kill his wife Lipika on March 3, 2013. Lipika accused Somnath of setting Don on her when she was pregnant. The dog is said to have bitten her in the abdomen before neighbours intervened. A Vet went on record stating that the dog attacks when confined for a long time and not kept well or treated in a friendly way. Whatever it be, today, Somnath was granted conditional bail by a city court in a domestic violence and attempt to murder case lodged against him by his wife, Lipika Mitra. “Serious allegations made by the complainant (Lipika) in complaint are in consonance with her recorded conversation with applicant (Bharti). 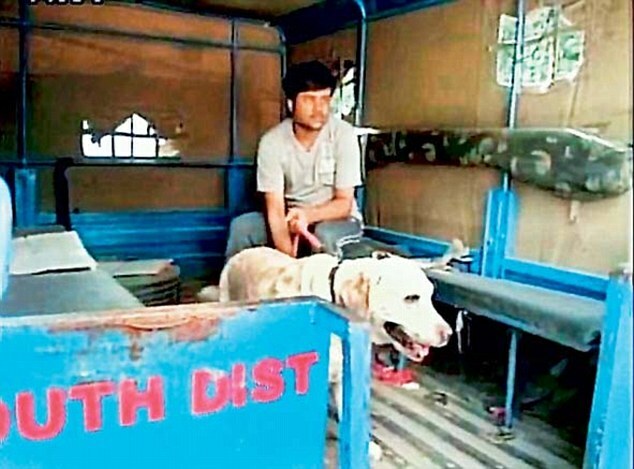 Recorded conversations on the point of dog bite and wrist slit reflect different versions… No purpose is going to be served by keeping the applicant further in custody,” the Delhi sessions court stated. Referring to Delhi Police case diary containing details of the examination of the MLA’s dog, Don, the court said the canine, accused of attacking Lipika, does not “respond” on his command. Additional sessions judge Anil Kumar said the court did not agree with the police apprehension that Bharti may flee abroad. The court also stated based on the police file, it “finds no medical evidence” in support of the incident of alleged wrist slit and added medical records only mention about “old cut marks but no external injury”. The judge said after the alleged incident of dog biting, it was “still kept in her house by the complainant” and she was “concerned of responsibility of dog” while Bharti was not there. The court observed the dog being taken care of by Lipika was “despite the fact, as alleged by her, that this dog assaulted her just one-two days before, on command of applicant.” The court has enlarged Bharti on bail subject to his furnishing a personal bond of Rs 1 lakh, with one surety of the same amount. The court imposed several conditions on Bharti. The AAP MLA has been prohibited from leaving Delhi without prior permission from the trial court and he has to report once a week in the office of the deputy commissioner of police (South-West) till the charge sheet was filed. It also directed Bharti to join the investigation as and when called and not tamper with evidence or influence witnesses in the case.